Fastbind End papers are glued together with the perfect bound book block and cover the inner surface of the hard cover, after the book has been bound. 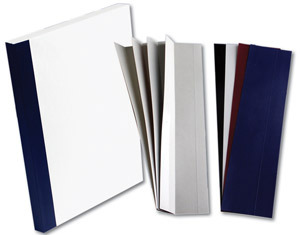 The pioneering Fastbind Casing-in sheet™ transforms any soft cover book into a valuable hard cover book. 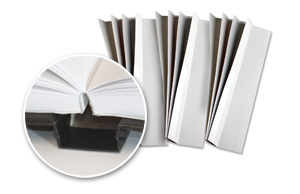 It enables you to attach a hard cover to the bound block made with your existing glue binder. The Fastbind Casing-In Sheet™ is very different from a standard endpaper: It is in between the end sheet and the cover, never to be seen. So, the end papers of your book (front and back) can be colored, printed and even foiled or laminated! 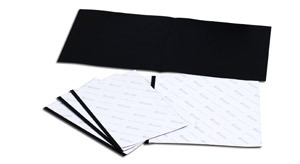 Fastbind Manager Strips are made of high quality leather imitation material. Use these strips with the Fastbind Hot melt binding machines (Secura and Elite).The three standard sizes allow you to bind up to 13, 26 or 40mm thick, in A4 Portrait.